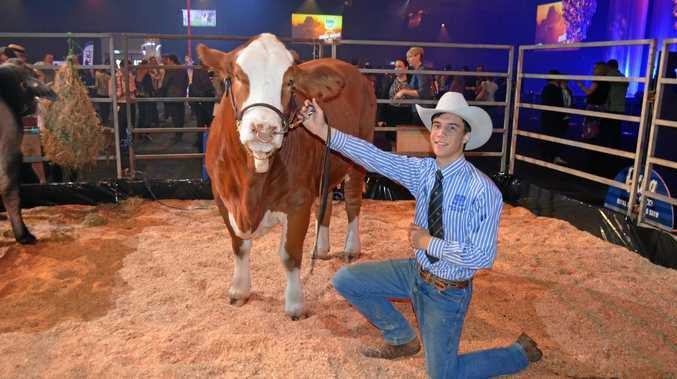 THE Ekka spirit was alive and well at the show's official launch in Brisbane. Cattle from Nudgee College, show dogs and roosters were all brought into the big smoke to ring in the Royal Queensland's Show 140th year. In an extravaganza of an event, cheerleaders, models, singers and showman performed on stage while show food, including tasty strawberry Sundays were offered to the crowd. RNA chief executive Brendan Christou said the 140th anniversary was an opportunity to thank Queenslanders for their support of the show. "The Ekka is the people's show and this year we are celebrating its 140th anniversary by giving back to the people who have made the show what it is today,” he said. This year there will be half-price tickets and two fireworks shows of an evening. "Two of the most popular Ekka attractions are the night show and our great food options; the new Twilight Ticket means people can come to Ekka from 6pm till late and enjoy the show for half price,” he said. Queensland's largest annual event has a remarkable history, being staged every year except for just two - in 1919 due to the Spanish influenza epidemic and in 1942 during World War II. Mr Christou said over the past 140 years more than 30 million people have attended the show, making family traditions and childhood memories to pass down through generations.